The Cupcake Life’s for Me! Heck if I know what I want to do with my future. I sit and ponder this as the years go passing by and I become more and more confused. I said before that my childhood-self had wanted to be a teacher (and a nurse, and a mommy, and a princess), and I thought the most realistic of those childhood dreams would be teaching. There are those who don’t take it seriously because I have changed my major so much. If you aren’t familiar with that drama let me list it for you. Elementary Education at Liberty University Online. Now I’m considering yet another childhood dream. Baking. Now, ask anybody who knows me and they’ll tell you I don’t like to cook. They’re only half right. I don’t like to cook in MY kitchen and with good reason, thank you much. There’s no stove and no sink. There’s a single burner plug in the wall cooking unit, a toaster oven and a microwave oven. Pray tell how I’m supposed to work with that? Please. But y’all, put me in a kitchen with decent stove, some appliances, and a fridge full of ingredients to work with… and we can start talking and baking, and cooking. Mama told me today that I don’t sound like a Kindergarten teacher. I asked her what I sounded like, and she told me I sounded like a frustrated baker. Mind you I was waxing poetic about the cupcakes I’d like to make and how I wanted to have a small bakery where people came in and got my stuff and walked out with a smile, because I had made something that made them happy. My mind is filled with cupcake and other dessert ideas. Like an eggnog cupcake with a whipped cream nutmeg and cinnamon topping, sprinkled with a touch of nutmeg. Or like this chocolate chip cupcake with chocolate buttercream icing sprinkled with chocolate sprinkles. Or similarly this chocolate chip cupcake with an edible cookie dough ‘frosting’. A lime cupcake with a cherry frosting and a cherry on top! Cherry Limeade Cupcake! Little cupcake cheesecakes and pies. Edible glitter candied or caramel apples. Lemon berry cupcakes with a lemon glaze and fruit whipped cream frosting. Coffee cupcake with Italian cream frosting. Lemon cupcake with meringue topping! Coconut chocolate and almond cupcake with a fudge icing! Almond Joy in a cupcake! A cinnamon cupcake with a caramel apple filling and a cinnamon frosting and caramel drizzle. I have so many ideas going through my head that I can’t list them all. Oh, I had this idea for a pavlova shaped in a cupcake liner to look like a cupcake, and drizzle it with fresh fruit like strawberries, kiwi, blueberries, or blackberries. I want to experiment with tea based flavors. This is the south after all. A sweet tea cupcake with a lemon or peach buttercream frosting. A vanilla chai spiced tea cupcake with a vanilla bean and cinnamon frosting. I have so many ideas, ideas which I think could potentially be popular. So, ideas I have. But the place and finances to experiment and master my recipes not so much. Realistically I know that I need to take courses in not just baking techniques, but kitchen management, business management (ew!) and various other skills, because if I want to do this, I want to do it right, and I want to do it myself. I’d love to work with somebody, but not really for somebody. I can take suggestions, but at the same time, I think I tend to be rather bossy in the kitchen. So, there you have it. The battling of the careers. One’s a childhood dream, the other a passion. Which is more realistic? Which would I not be miserable getting up and stupid-o-clock in the morning to prepare for the day? 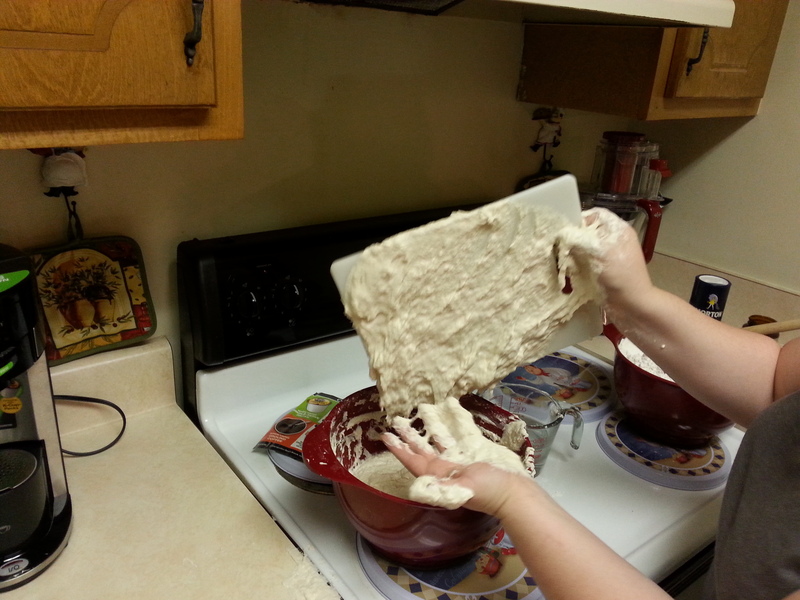 Teaching or baking. I like the DIYness of dessert making, because I do like crafts and DIY and I love the idea of being able to be imaginative and creative and I especially love the idea of making people happy with my food. There’s a lot to consider, and this is not something to just jump in to headfirst without research. Stay tuned as this dilemma unfolds and I make my final decisions regarding my future. 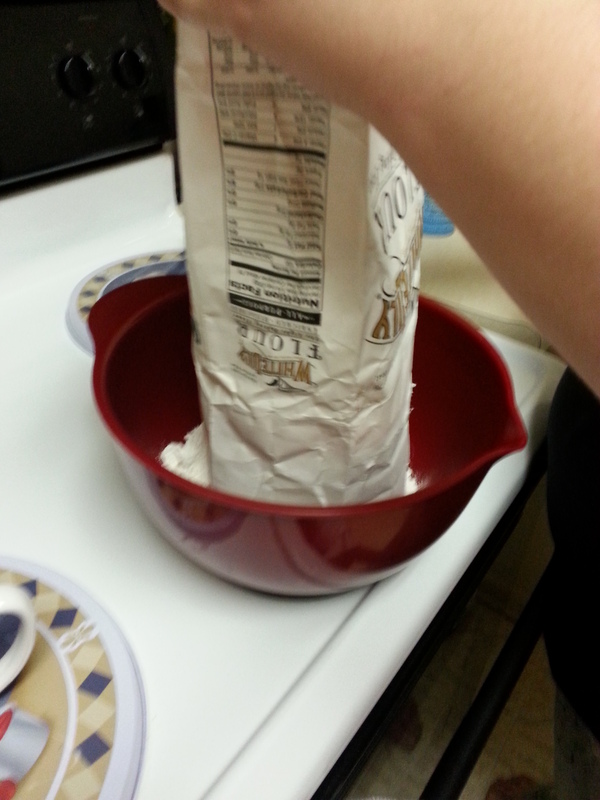 I said this wasn’t a cooking blog… it may end up that way, at least to some extent! Go figure! This is not really a cooking blog, although it certainly seems like that as of late, but it is the holidays, so… yes, there is a lot of cooking going on. I’ve been watching Cupcake Wars on Netflix, and I’ve been craving sweets, so this cupcake recipe popped into my head. I want to make a lemon cake mix, (or a white cake mix and add some lemon extract if lemon cake mixes don’t exist at my local Piggly Wiggly or Harvey’s), some fresh raspberries and make a compote, assuming that’s Chef language for cook down the raspberries with a touch of sugar (or cheat and buy some raspberry preserves), take out a bit of the center of the cupcake and add the raspberry compote/preserves, and top it with a raspberry cool-whip icing, with a fresh raspberry on the top. I don’t want this to be a heavy dessert. The raspberry filling is going to be the sweetest thing in there, and that’s how I like the idea. I think this would be super delicious with an angel food cupcake, which is already light and fluffy and awesome with fruit toppings. Actually yes, I think what I’m going to do is use an angel food cake mix and make that into cupcakes. I’ll take out a bit of the center of that and add the raspberry compote/preserves, and make a cool-whip frosting with lemon pudding in the mix and fresh raspberries whipped in to top it with. I might make this on the 23rd when I make the dessert lasagnas, depending on if Sandra’s willing to let me use her kitchen for three desserts (I promise I’ll clean up!) and if I can find raspberries this time of year. More than likely I’ll make them next month after things ease up from the holidays. Until the 23rd then, loves! Alrighty then, the cousin and I made a quick (ha!) 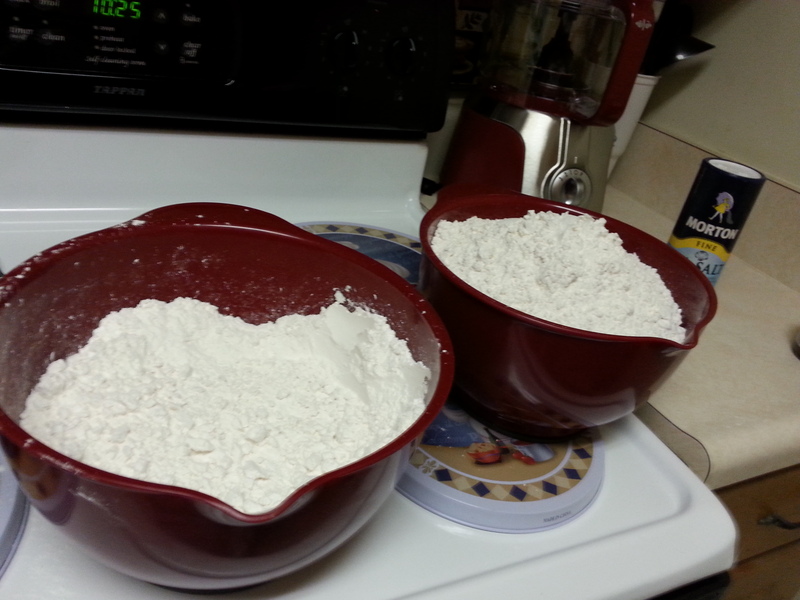 trip to Wal-Mart and bought two more bags of flour and a larger mixing bowl. ($11.47 for a bowl?!) 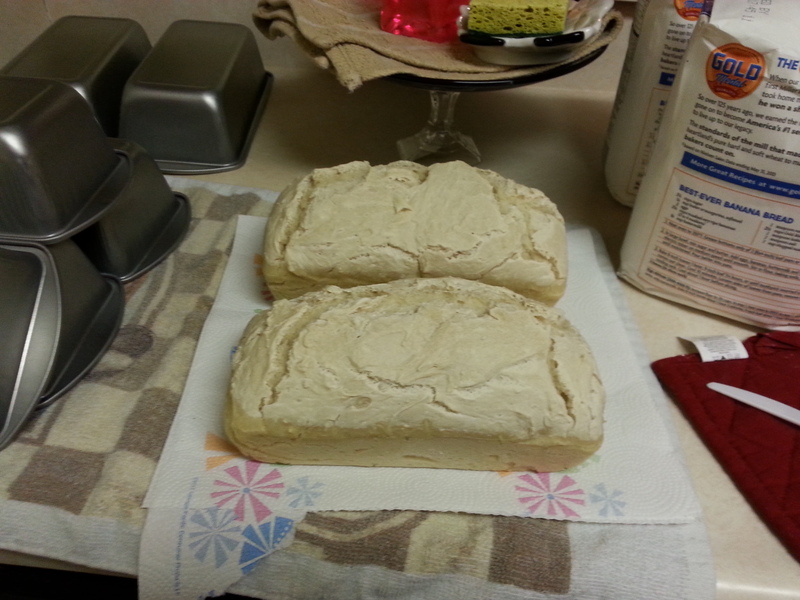 and decided to try again after we saw how our first batch of bread made. It kind of looks like a loaf of biscuit, doesn’t it? It ended up absolutely yummy, but incredibly dense. We weren’t really sure what we did wrong until after some research. 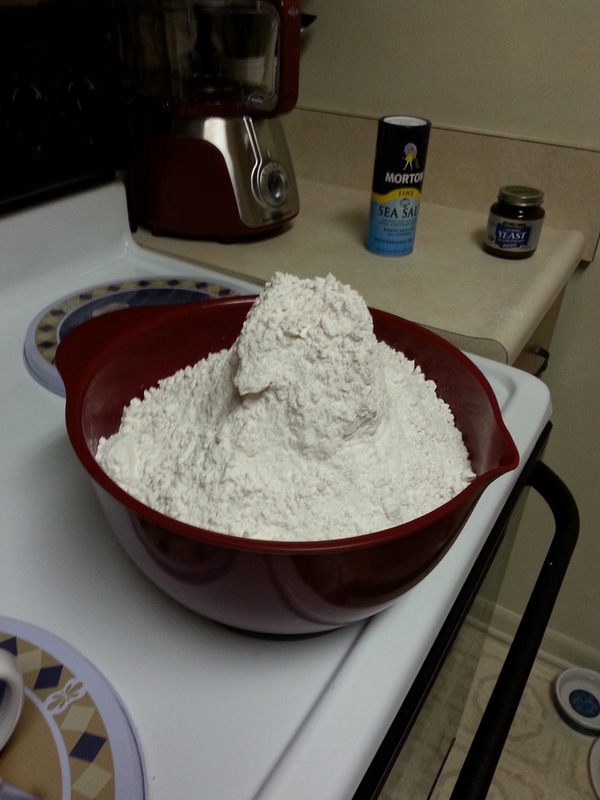 It turns out that we added too much flour to it, which is odd, because it was a very wet dough. Also, we probably didn’t give it enough time to rise like we should have. See.. it just doesn’t look quite right. At least it tastes good! No, she’s not crazy at all! 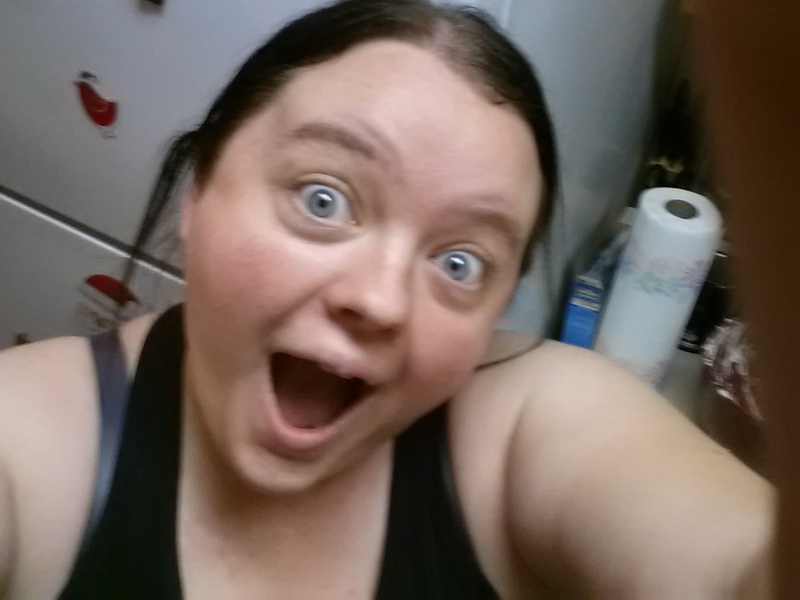 The cousin took a selfie on my phone, so I’m putting it on my blog. Love you, cousin! 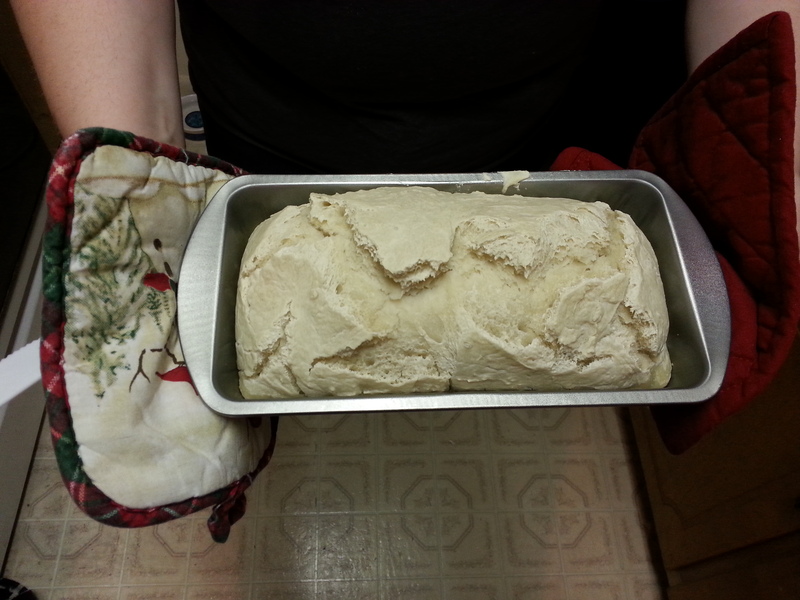 More to follow after this dough rises.